The freeways snuck into my life — from birth I’ve used them without knowing how they were made or who made them. Like our running water and electricity, these resources assist our daily lives, yet we rarely appreciate or acknowledge them. Our progress in mastering the land has separated us from the very thing that gives us life. 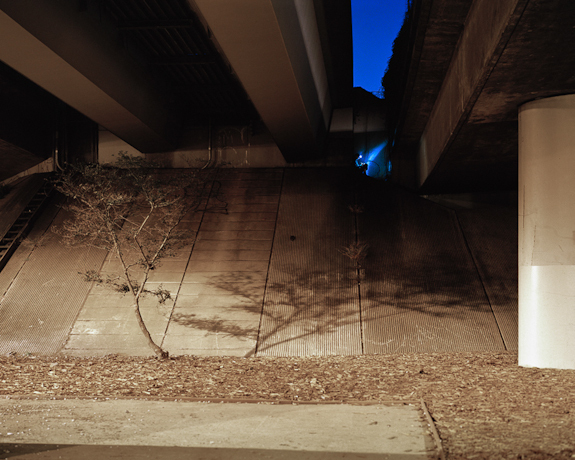 In this new body of photographs, called In/Finite Potential, I put myself in context with the Bay Area freeways. I am fascinated by the contrast between these inhospitable structures of utility and a small, fleshy human such as myself. I look for unexpected beauty in these forbidden lands, as I trespass with a combined sense of research and rebellion. My feelings for these freeways remain complex. I appreciate the actions necessary to create these structures: communal decision-making, resource sharing, and hard physical work. I am fascinated by how these monolithic structures have affected my life, as well as the lives of the people around me. I selfishly value these freeways for their willingness to help me get from point A to B, and for the wealth of experiences that accessibility allows. I am angry with these freeways for their support of our planet’s environmental destruction, and for upholding a theory of progress in which we continue our separation from the land. 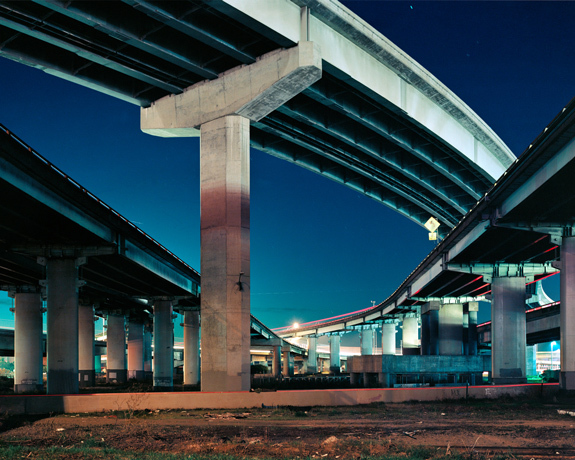 Moreover is the freeway’s seeming inability to be loved. I sing it songs, admire its weeds, rummage in its untold nooks and crannies, but as yet it appears unaffected.